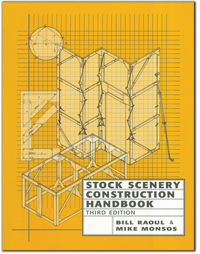 Widely adopted as a college textbook, Stock Scenery Construction Handbook has long been one of the most complete manuals on scenery construction you’ll find, as well as one of the easiest to use. Now, with this brand new third edition of the popular text, Bill Raoul’s colleague Mike Monsos has fully updated the book throughout to reflect the evolving nature of theatre design. This comprehensive book contains over 180 full-page drawings showing construction techniques for every conceivable kind of stock scenery piece, from flats (plain ones, door units, hardwall, etc.) to platforms and step units (including two kinds of parallel platforms and even folding-brace stairs). Read more...An entire chapter is dedicated to all kinds of soft goods like curtains and drops, and there is a chapter devoted specifically to paint as well. Raoul’s wry sense of humor will delight and entertain every reader as they work with this excellent resource, a must-have for ever set builder. Learn how to construct free-standing scenery to convert any space into a theatre.